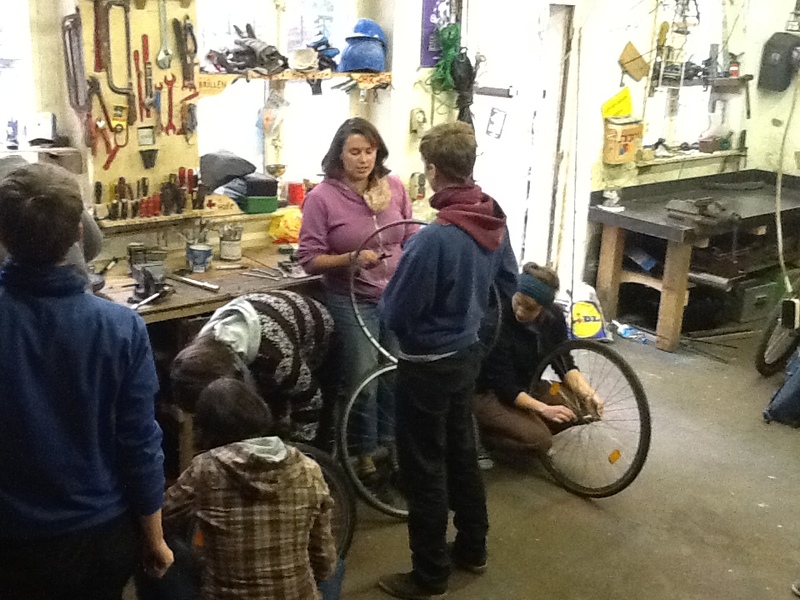 Last week I taught the first of a series of bike mechanic classes for women and trans cyclists at the PlattenLadden Collective in Kreuzberg, Berlin. 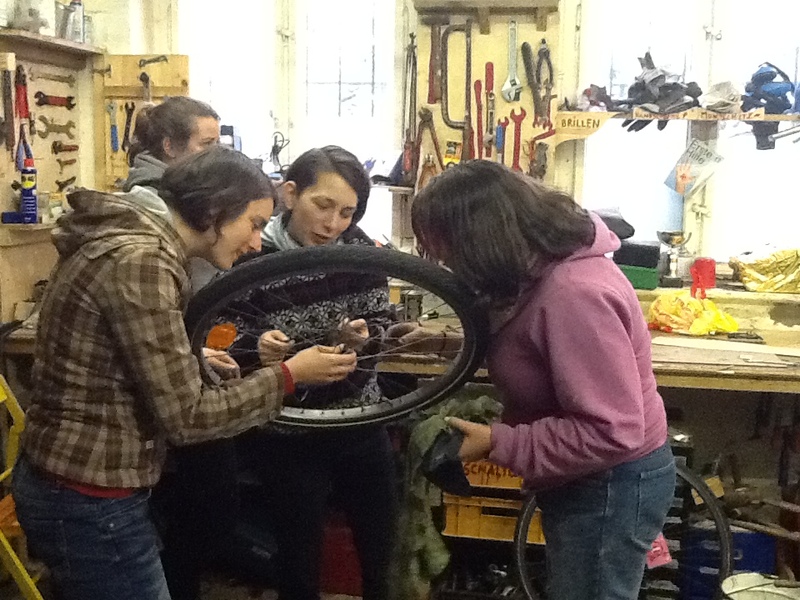 Every Monday the collective holds an open shop where anyone and everyone from the community can come to use tools, find parts, and have a communal dinner. I’ve been going once a week since arriving in Berlin to fix broken spokes (bike polo has been slowly killing my front wheel), and help out the best I can given my limited language skills. A few weeks ago, after hearing about my project/fellowship, a friend asked if I’d be willing to teach a class for women and trans cyclists at PlattenLadden. I gladly accepted the offer, because teaching mechanic courses is one of my favorite ways to engage with communities. We decided the first class would be on overhauling hubs, and then have open shop for a couple hours after for anything else. So last Tuesday I arrived at PlattenLadden, hoping that at least one person would show up, and was surprised that throughout the night about 15 people came. We spent the first half hour eating baked goods and drinking tea and coffee while sharing names, favorite bike parts, and our thoughts on women and trans bike spaces. In my travels I’ve seen a lot of different reactions to WTF (women/trans/femme) bike spaces, and I’ve heard a lot of familiar arguments against them. It’s suffice to say that I’ve learned a lot from talking to people who don’t share my views on WTF spaces, and although I’m not sure that anyone’s mind has completely changed during those conversations, I do think that each of those conversations has been instructive and helpful for me. I hope the people on the other end of the conversation feel the same way! Back to the point – while we were sitting and sharing our thoughts on WTF bike spaces, I heard a new argument against that I’d never heard before. Some of the participants who are members of the PlattenLadden collective said that some male members were against holding too many WTF workshops because people pay a membership fee to the collective to have keys and be able to use the space whenever they want (the space includes a bike shop, all sorts of carpentry and welding equipment, a music room, sewing room, kitchen, printmaking studio, etc. – so yea, it’s pretty awesome). When the space is being used for WTF workshops it means that people who pay to use the space can’t use it during that time. It’s a new dimension to WTF spaces that I’ve never encountered before. Most spaces in which I’ve participated are hosted in bike shops, or bike co-ops that don’t operate on a membership basis. The whole idea that people pay to use the space whenever they want complicates things. Admittedly, I think not being able to use the space for a few hours every few weeks isn’t really too much to ask. And I’m not at all biased in this opinion. One of the participants suggested that I talk to some of the men of the collective and ask them about their views on using the space for WTF workshops. And I think I’ll take up the suggestion, because I think there is always something to learn from those conversations, and it’ll be cool to learn more about how membership to the collective means. All that being said, both the conversation and the workshop were great. Whenever I participate in WTF bike spaces it reaffirms my belief in their importance and awesomeness. I leave with a smile on my face, and some new friends I might not have met otherwise. And those two reasons are what keep me going back.